Dowlas Director Gemma Hughes will be attending the North Somerset Business Awards 2013 having been nominated for young business person of the year. The awards are open to businesses in North Somerset who have a significant presence in the region. 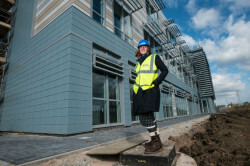 Thanks to Gemma’s dedication and leadership Dowlas have successfully constructed the 2nd largest commercial offices to go up outside of London in 2012. The offices for Knightstone Housing Association are situated on the main A370 providing a powerful impact and frontage to the new Weston Gateway Business Park in Weston-super-Mare. In recognition of the work Gemma has achieved with Dowlas she has now been shortlisted to the final 3 for the Young Business Person of the Year award having successful getting through the written application and interview stages of the awards process. Gemma says, “ I am absolutely delighted to have been shortlisted for this award. It has been a steep learning curve since I took over at Dowlas UK Ltd but since my involvement the Weston Gateway Business Park project has flourished with all infrastructure now in place and a new marketing strategy implemented. I am looking forward to a glitzy night with fellow businesses in North Somerset”. Winners will be announced at the awards ceremony taking place at Double Tree Hilton, Cadbury House, on Thursday September 26. The North Somerset Business Awards 2013 offer a brilliant opportunity to bring together the most successful companies and entrepreneurs in North Somerset to celebrate the business success that this thriving region has achieved in recent years. The North Somerset Business Awards are in association with Business Leader Magazine.